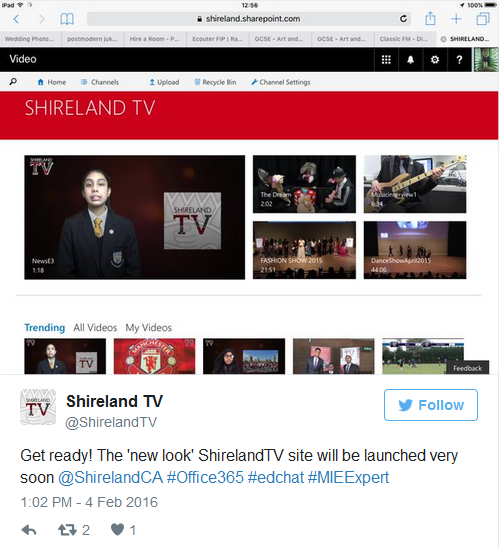 Shireland has for well over a decade had a national reputation for using technology well not only in the classroom but also as a means of underpinning and improving school processes. It supports all areas of school life, from day to day administration to family engagement and streamlining the planning process. It was only with time and the development of technologies, as they became easier to integrate into the classroom, especially better quality webcams, that it would revolutionise our feedback process. It was the Head of Mathematics who initially questioned our existing procedures when we were discussing the ongoing frustration that marking students’ books did not always support students’ progress in a way that was proportionate to the amount of time spent by teachers doing this. It was noted that many of the issues in students’ work, in terms of common mistakes, literacy and next steps in order to make progress, were being replicated amongst a number of students. Marking books in the traditional sense can result in repetition on the teacher’s part, promote a focus only on books as evidence of students’ work and support the notion that ‘traditional’ marking is the principal form of effective feedback. Students also did not truly value our more traditional marking approach and comments from an online questionnaire confirmed this with many responses stating that they struggled to understand the reams of text often written, especially our EAL students of which we have a high percentage. We had for many years used online class areas where teachers were able to share lesson plans, resources and canvass opinions of students, so when we decided that we wanted to explore the use of video feedback, we wanted to integrate it into this existing platform rather than create something separate. It was trialled in the Maths Department with data taken before and after. • To improve students’ attainment through higher quality feedback. • To improve students’ engagement with feedback, encouraging them to take ownership of their own learning and progress. • To promote more effective and efficient use of teachers’ time. We made the process clear and simple for teachers and students to follow. • Linking the camera function on the teacher’s device to a YouTube account (we called it Shireland Maths Channel) and then setting up an Excel Markbook for each class that was accessible on the class site took care of the logistics. • Teachers identify common misconceptions by taking a sample of students’ work (approximately 20%), making notes on the general subject related issues, as well as other issues such as literacy and presentation. • Teachers create two or three separate YouTube videos that address each of the subject specific points identified, ensuring that each one contains at least one example and at least one question for students to give them a chance to address the error. • The videos are then uploaded to YouTube and the link to each video is copied into the formula bar of the Excel mark book. Teachers protect the Excel sheet with a password, preventing students from amending the feedback. The results after the pilot period in mathematics was quite significant. 77% of a Year 11 C/D borderline group made 3 or more levels of progress in mathematics in their 2013/14 GCSE mathematics examinations, a higher percentage than the national average of 65%. This is even more impressive given that over 50% of the group arrived at the academy with KS2 level 3 in mathematics. Students engaged well with the video and class site feedback system, irrespective of gender and prior mathematical ability with many students expressing a preference for addressing their feedback in lesson time, something that had very rarely happened without being prompted before. For teachers it was a double whammy. Not only were they reducing their marking and feedback time significantly, but also they were getting better levels of progress with their students. The results in the department were shared with the rest of the school and now it is an approach which has been adopted by many other departments. It might also be handy - for use at home - to link some QR codes to the videos and slap them on students' books. So that when they return home they can scan the code and look at the video there and then. What a great idea, do the teachers' comments remain their own intellectual property or does this become a profit stream for the school? Also how does the time required to film, edit and upload the vfeedback equate against the time saved in writing in the children's books. I like the idea of the qr- codes but this would pre-suppose the production of the video, including editing and uploading of the demonstrations, and as anyone who's tried to do similar, label marking, the production of the labels is not a zero-time activity. I suppose my comment is curious about the workload that this innovative technique would incur.